After the Audi RS Q3 Concept surfaced on the automotive world it seems that the carmaker decided to widen their range of sporty SUVs with the upcoming Audi SQ5 TDI 2013, the very first S model sporting a diesel engine. The SQ5 made its debut at this year's 24 hour Le Mans race, and since the Audi Sport Team won the event in the LMP1 class I can't think of a better place for them to unveil a new sporty diesel vehicle. Under its hood the SQ5 packs a twin-turbocharged 3.0 liter TDI power plant able to produce 313 horsepower and 479 lb-ft of torque. The unit is mated with an eight-speed tiptronic quattro transmission which permanently sends the engine's power to all four wheels. The sporty SUV can go from 0 to 62 mph in just 5.1 seconds, it boasts a top speed of 155 mph and with the help of a start-stop system as well as a regulated oil pump, theSQ5 has an average fuel consumption of 32 mpg. As a standard the S model sits on a set of 20-inch allow wheels featuring a five parallel-spoke design and 255/45 tires, but the carmaker offers a set of 21-inch wheels as an option. Furthermore, the Audi SQ5 has been fitted with a new sport suspension system which lowers the body by 1.18 inches, and a drive select system which can be optionally upgraded to include dynamic steering system with variable steering ratio. On the exterior the SQ5 differentiates itself from the rest of the pack with the help of a platinum gray single-frame front grille, redesigned front and rear bumpers and the addition of a roof spoiler. The SUV will be offered in either Estoril Blue or Panther Black paint finishes. On the interior the S model will offer power-adjustable sport seats covered in Pearl Napa leather or Alcantara, and brushed aluminum inlays as standard. Optional extras will include four choices of leather upholsteries, lunar silver headlining and Carbon Atlas, Piano finish or Aluminum/Beaufort wood trim panels. Evidently the "S" badge will be present in numerous locations in the cockpit, such as on the gear lever knob, the door sill trim, the redesigned steering wheel and the start button. 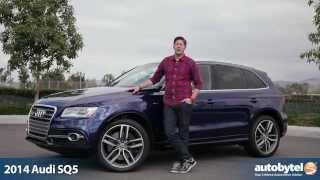 The Audi SQ5 TDI 2013 is expected to hit the market during Q1 next year and will have a base price of €58,500, but as far as availability in the US goes Audi has not revealed any plans regarding the matter.